The drain is constructed of solid, heavy, genuine brass for lasting durability, and is exceptional quality and longevity by more than 200000 times a trouble-free test. The drain with overflow hole is designed for sinks with a push up and down mechanism that allows it to open and close the drain, to prevent water overflow the pot is overfilled. 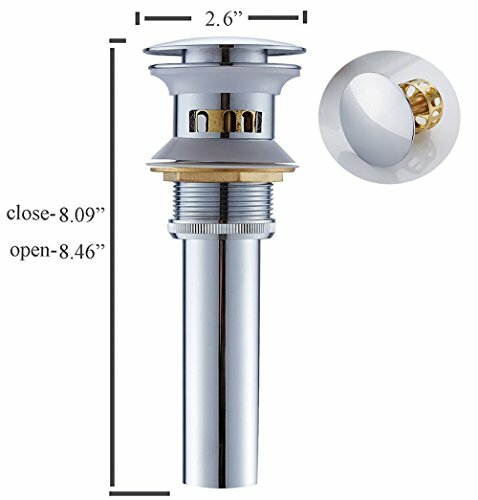 Drain is designed to fit bathroom, kitchen and lavatory vessel sinks, or any sink with a drain hole from 1.65" to 2.17" in diameter (fits almost all sinks), bring novelty and grade style. This is a push-button style drain, simply press the top of the pop-up to close, and another press to open. Got detachable basket design of drain with anti-jam function to prevent hair and other debris into drains is humanized and is convenient when you clean up, you just holding the push button to pull out , then lift the basket of drain and clean the filtered debris. 1) All dimensions are measured by hand, there may be 1-3cm deviations. 3)The drain of "Overflow Style" for use with standard sinks and vanities that have an overflow hole at the top of the sink bowl; the "Non-Overflow Style" for sinks without an overflow. 4) One Year Manufacturer¡¯s Warranty. Or you can directly contact us, when you meet with quality problems. Fits sinks with 1 5/8"(min) drain holes, please check hole size of your sink before purchase.